This week, the Chicago Cubs gave away what is, I guess, the last of their 2016 World Series rings. And I guess that’s appropriate because it was received by probably the last person many Cubs fans would have imagined would get a ring. Until last year, the closest the Cubs had gotten to even playing in a World Series since 1945 was in 2003. The Cubs were playing the Florida Marlins for the National League pennant and a spot in the World Series. It was Game 6. The Cubs led the best-of-seven series 3 games to 2, and they had a 3-0 lead in the top of the eighth inning at Wrigley Field. The air was electric. With one out already in the eighth, the Cubs were five outs away from breaking one of the longest droughts in professional sports. When Marlins’ second baseman Luis Castillo hit a lazy foul down the third base line, it looked like the second out of the inning. Cubs left fielder Moises Alou drifted over. 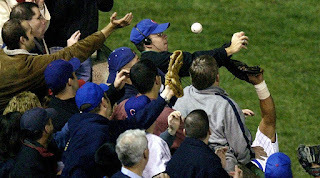 The ball was floating toward the stands, but Alou was there and jumped to make the catch near the first row of seats. Except a guy named Steve Bartman was sitting there. A lifelong Cubs fan, he must have been thrilled to have those seats down the third base line, and even more excited to have the chance to catch a foul ball. Maybe he was a little overeager. Maybe Castillo should have been ruled out due to interference, as replays seemed to show Bartman’s hand extended out past the stands. In any case, he didn’t make the catch, and neither did Alou. The Cubs went on to give up eight runs in the inning. They lost game six 8-3, and they never seemed to be in game seven. Things didn’t go any better for Bartman. Fans sitting around him (some who had tried to make the catch themselves) berated him, threw beer and food at him, and threatened him. He was eventually escorted from the stadium by security. He was placed under police protection for a while. He refused interviews, stayed out of public view, and as far as anyone seems to know has never returned to Wrigley Field. My very unscientific poll shows that Chicagoans are mostly in favor of Bartman getting a ring. Predictably, though, there are some who question whether he deserves it or not. Even Bartman himself questions that. Whether he deserves it — that seems like a strange way to think about it. It’s a gift. A peace offering. It’s a gesture that symbolizes there are no hard feelings and hopefully brings about closure and reconciliation. It’s of course true that he doesn’t deserve it in the same way the players, manager, coaches, front office, and owners deserve it. But it isn't about what he deserves. It’s about the giving of a gift. So much of human life seems consumed by figuring out how to get what we think we deserve or making sure others don’t get more than they deserve. We struggle with the idea that life is a zero-sum game, that whatever someone else gets is something I don’t. That can be a harsh and uncompromising way to live, if for no other reason than when we’re honest we all have to admit that we don’t always deserve what we get and don’t always do enough to deserve more. That schizophrenia about what we deserve comes out in Scripture, even. The psalmist who wrote what we call Psalm 94 wanted God to be “a God who avenges,” to mete out to those who arrogantly pursue their own interests at the expense of others “what they deserve.” And there are times when we pray for that, aren't there? And times when it seems absolutely right that we should. So do we want God to give us what we deserve, or not? I guess that depends on what we think we deserve. In one of his letters, Paul generalizes us all with one phrase: “we were by nature deserving of wrath.” Not a lot of wriggle room there, huh? It’s offensive. He lumps us all together. All that Old Testament, fire-and-brimstone stuff is what our sins deserve from God. We’ve all done enough to merit only his judgment. But in spite of that, he goes on to say that God loves us. He explains what God was doing through Jesus by using words like mercy, kindness and, most often, grace. Though our actions had rendered us essentially dead, God in Jesus made us alive. He didn’t do this in response to anything we have done, or even because he believes in our potential. It’s by grace that we’ve been saved, rescued from our hopelessness and death and given life. It’s for everyone who puts their trust in Jesus. And it has nothing to do with what we deserve. We would do well to remember that. When we’re inclined to brag about our accomplishments or our morality or our prayer lives or our service to the poor, we should remember that all we have is by God’s grace. When we’re inclined to look down on someone who in our view doesn’t compare too well to us, we should remember that nothing we’ve done makes God love us any more than anyone else. We should receive God’s gift of grace with — what else? — grace. We should show grace to others who might still be laboring under the assumption that they must deserve the love of God and the people around them. Here’s a thought: if grace doesn’t come easy for you in your relationships with the people closest to you, maybe it’s because you don’t understand the gift God has given you. Maybe you’re still consumed with being deserving of love, and maybe you’re holding everyone else to that standard. Just know that God will never love you less or more than he does right now. If you look at the world around you through those glasses, it might just change what you see.